Blog — Neon Moon Design Co. In honor of my favorite Leslie Knope inspired holiday, I thought I would share this free printable. I hope it inspires you to spend time with your favorite gal-pals, sip a cocktail, craft a Valentine or simply spend some quality time chatting on the phone. The women in our lives deserve to be celebrated - and this is just a small reminder to take the opportunity to remind the ladies in your life why they’re special to you. It’s down to the final weeks - and the nerves & excitement are real. The nursery is set up, the sweet little clothes are washed, the hospital bag is packed and I feel like I’ve done all the prep work I can. Now, we’re ready to meet our sweet little girl. As I was collecting gifts for all the special people in my life, (& wrapping them beneath the glow of my Christmas tree & the NFR on my TV) I thought I should share them - as a way to shed some light on some of my favorite finds this year & a way to share some of my favorite makers and small business owners. From in-laws to parents, boyfriends to gal pals, there's a little something special for almost anyone in your life. I love gift giving. LOVE it. I love finding something special that I know someone will really love, but would probably hesitate to spend money on for themselves, or give them something that speaks uniquely to them. First, is a collection of gifts for your favorite mustachioed cowboy - or caffeine loving cowgirl. I think of these as "old soul" gifts - for the man or woman that enjoys a nice cup of joe & some good conversation, old western movies & a good game of poker. This Stanley thermos, Cowboy coffee, and Pendleton mug - all make great gifts for the classic old-soul in your life. Add this incredible deck of cards from Molly Jogger, and they're ready for a cozy night at the cabin or their next camping trip. Another gift for the crusty old cowboy in your life, or the perfect addition to any cabin bathroom - this rustic soap set adds festive holiday charm to any care package or hostess gift. Or, it can be used to spruce up (ahem, pun intended) that slightly too "rustic" musk your chap tends to wear in lieu of cologne... AND they're currently on sale! These gifts are perfect for the fashionable lady in your life - whether it be your bestie or your mother-in-law - we all deserve a fun accent piece for our wardrobe. You can't get much cooler than this hand-tooled cactus cuff from K Bar C Leather. Check out her website for all sorts of neat things - purses, belts, trucker hats - this lady does it ALL & does it with incredible style. You can purchase a gift certificate for a custom item that will definitely please a special woman in your life. These incredible cherry red Minnetonka moccasins are from The Bluebell Mercantile, a goldmine for all sorts of gifts & goodies - you NEED to see the beaded bracelets and incredible hats they currently have in stock. Don't mind the shameless plug for my own hand-painted clutch - I just LOVE this colorful thunderbird design, or these fun leather-fringe concho necklaces that are available in my Etsy shop. Give one to a favorite gal pal, or tuck one in your stocking for yourself. Speaking of The Bluebell Mercantile - they have a huge assortment of the most precious and nostalgic Christmas ornaments - one of my favorite gifts to give. Seriously, can you believe how magical these western themed glass ornaments are?! I'm in love. This cuff from K Bar C Leather Co. is everything. Just a few of the necklaces available in the Neon Moon Etsy shop. My mother taught me that books always round out a gift. These two are ones that I've been eyeing for myself - so I knew they'd be fun ones to give to someone else. You can find How To Draw Modern Florals by Alli K, & this great Baxter Black collection of stories on Amazon. A bottle of wine is always a good idea. For a gift, I mean. Add an incredible label & it's the perfect hostess gift. This bottle is one of my favorites. This Santa mug is the perfect vessel for hot toddy's or hot cocoa - so it can be given to friends and family of all ages. Plus, it's so darn cute!!! I hope you enjoyed my little gift guide - nothing too fancy, nothing too expensive - but a few unique pieces that will make someone special very happy. Merry Christmas! I recently created this logo for a client that wasn't afraid of adding some serious western flair to her consulting business. I can't help but adore a design client that asks for even MORE western - so I added cacti, a spur, & western fencing to the logo I had originally created for her. 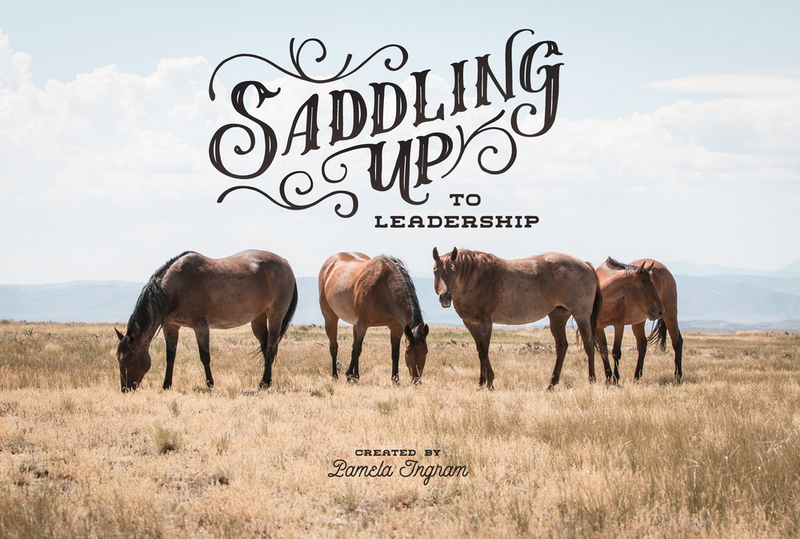 Cacti, and spurs, and vintage western lettering - oh my. The making of a very western logo. I was asked to create two cohesive logo designs - one for the primary logo & name of the company, one for the presentation & educational content my client was creating. I used the same hand-lettering style to make sure the two gave the same branded feel. The beautiful photography we used for the cover art is by one of my other clients - Western Legacies. Have you heard the news?! Neon Moon Design Co. now has graphic t-shirts for sale! This design is entirely hand-lettered and hand-drawn, on a vintage wash t-shirt that fits & feels like a favorite t-shirt should. The tee is available in unisex sizing, and three colors - turquoise, red & gray. I'm so excited about this. I've wanted to design my own line of graphic tees for a while now - and I'm hoping this is just the beginning. This t-shirt is the perfect accessory - whether it's layered under a denim jacket or a floral duster- it has all the right vibes, and a fit & feel that will make you want to wear it everyday. Follow the SHOP link to purchase one for yourself! This is one of my favorite quotes - and I thought I'd share it because the world is in need of a little prayer, a lot of positive energy and as many blessings as we can give it. Here's to Texas, to Florida, to Montana, Idaho, Oregon & Washington. Because the cruelty & irony of half our beloved country being on fire, and half being under water, is just too much to bare. 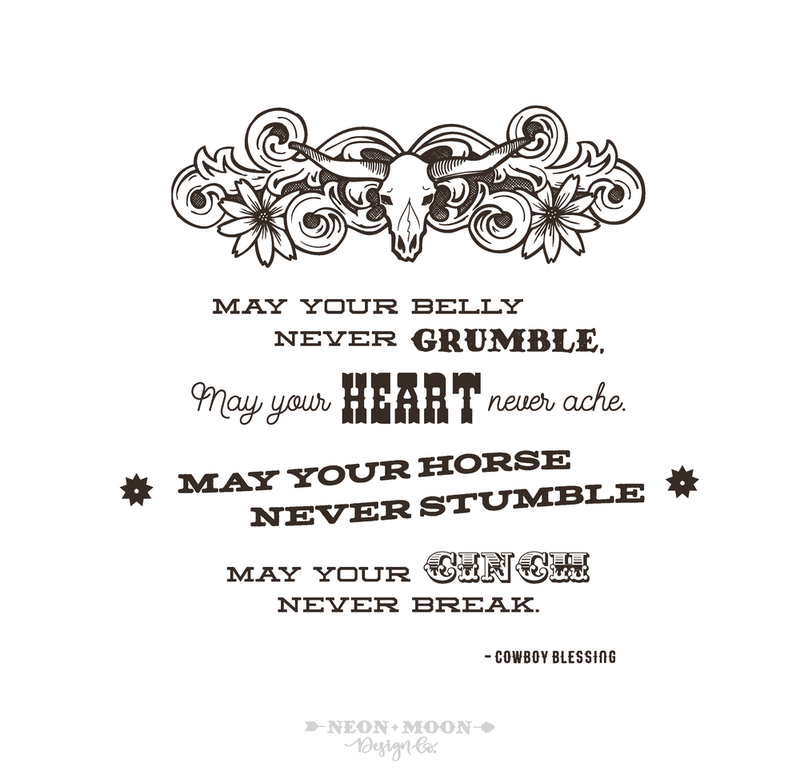 So please, feel free to download this free printable and post it where you can see it - on your fridge, inside your hat can, in your tack room or trailer. And remember to cherish the fleeting everyday things - like our family, friends & pets - that are oh so dear. Because everything else can be replaced. Etta - Neon Moon Design Co. I recently completed a logo & other marketing materials for Horse Crazy Market & Horse Crazy Holiday Market - a company that styles events & opportunities for vendors & horse enthusiasts in Saint Paul, MN, as well as selling unique clothing & accessories under their brand. You can learn more about upcoming Horse Crazy Market events, including the Horse Crazy Holiday Market held at the State Fair Coliseum Dec 2nd & 3rd, on their website or Facebook page. Because of the multifaceted nature of Horse Crazy Market, we needed a logo that could be augmented & adjusted to work for the multiple different events & businesses the name represents. Here it is, my latest logo creation! This logo is for Western Legacies - a photography team with a passion for capturing the western way of life. Jordan & Krystal, the hard-working cowgirls behind this company (& behind the lens) wanted a logo that had a retro cowboy feel, with a tooled-leather look, and very indicative of their pride in the western, ranching way of life. The predominant 'Western' script is hand-lettered, and the logo artwork is hand-drawn. As you can see, we created several different versions of the logo, as well as a text only version to be used as a watermark on the client's photography. I believe in the power of variety & versatility in my logo designs, and like to give my clients several logo options for their marketing needs. Thank you Jordan & Krystal for this opportunity! And thank you for strong ideas & inspiration - I love the final result! That's right. I have another logo reveal this week. This one is for the incredible U Bar & Co. Boutique. Paula describes her boutique as 'traditional and trendy styles & accessories' - and she carries unique western tees, incredible rompers, western-inspired shirts & dresses - and I'm a huge fan of her jewelry and fringe serape clutches. I feel so lucky to have found such inspiring and creative clients. When Paula came to me, she knew right away that she wanted her logo to be centered around her beautiful black & white longhorn heifer (pictured below). She wanted something western but feminine, and loved the idea of incorporating both floral and cacti. You need to check out U Bar & Co for unique, eye-catching western fashions. The inspiration behind the logo. A few of the secondary, more simplistic versions of the logo. The drawing behind the logo. I'm so incredibly excited about this logo. When Alyson came to me with her ideas for this project, I was over the moon. I have created artwork for Alyson before, and she is always wonderful to work with - positive, enthusiastic, and full of incredible ideas. She's what this graphic designer's dreams are made of. This logo is for Alyson's soon-to-be online boutique Thunderbird Collective. 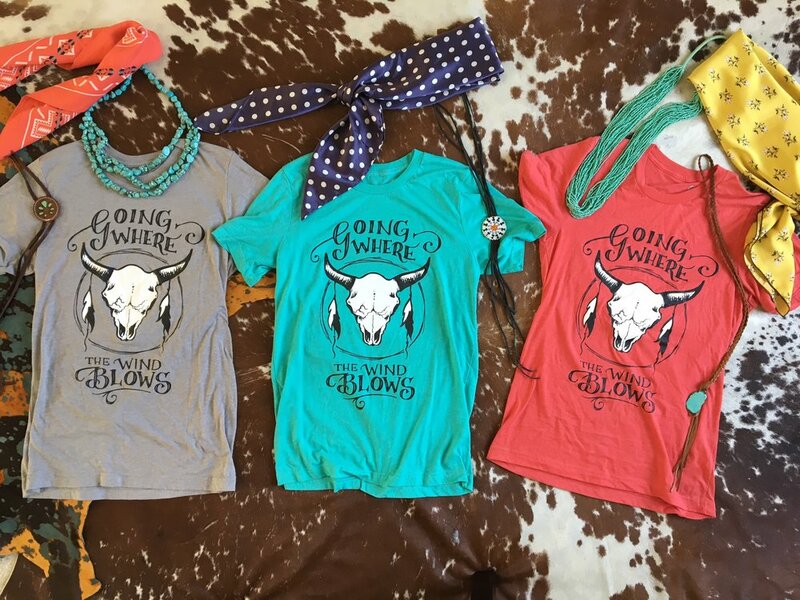 She describes it as a 'ranchy meets boho' specialty boutique with eclectic tees, apparel, accessories, and home decor. When I asked who her ideal customer was, she said her customer is 'female - early twenties to sassy 60's and has an appreciation & love for the past and vintage. She's an old soul. She has a deep emotional connection to old barns & old pick-up trucks. She would prefer to spend the day sipping sweet tea and eating buttermilk pie on her family's front porch. She most likely has a strong agricultural background. She has simple roots & big dreams.' Oh, and she listens to Miranda Lambert, The Eagles, Waylon Jennings and Fleetwood Mac. Do you understand now why I love this lady's vision. She descriptive, specific, and right up my alley. LOVE. We agreed that the logo should feel a little bit country, but a little bit 70's rock-n-roll. Vintage and nostalgic, feminine yet bold. I am so excited & proud of the finished product. The logo is entirely hand-lettered and hand-drawn - which adds an approachable & vintage western vibe to the bold, simple thunderbird emblem. Since her vision was so deliciously specific, and it would be a shame not to, I have also shared the mood board I designed inspired by her dreamy descriptions, as well as the several different versions of her logo that I created, plus a few collateral items. Obviously, you need to stay tuned, because the Thunderbird Collective is what every dirt-road-driving, road-trip loving, graphic-tee wearing, day-dreamer needs in their life. I am so thrilled. Thanks for allowing me to be a part of this project Alyson. I CAN NOT WAIT to see what's next. 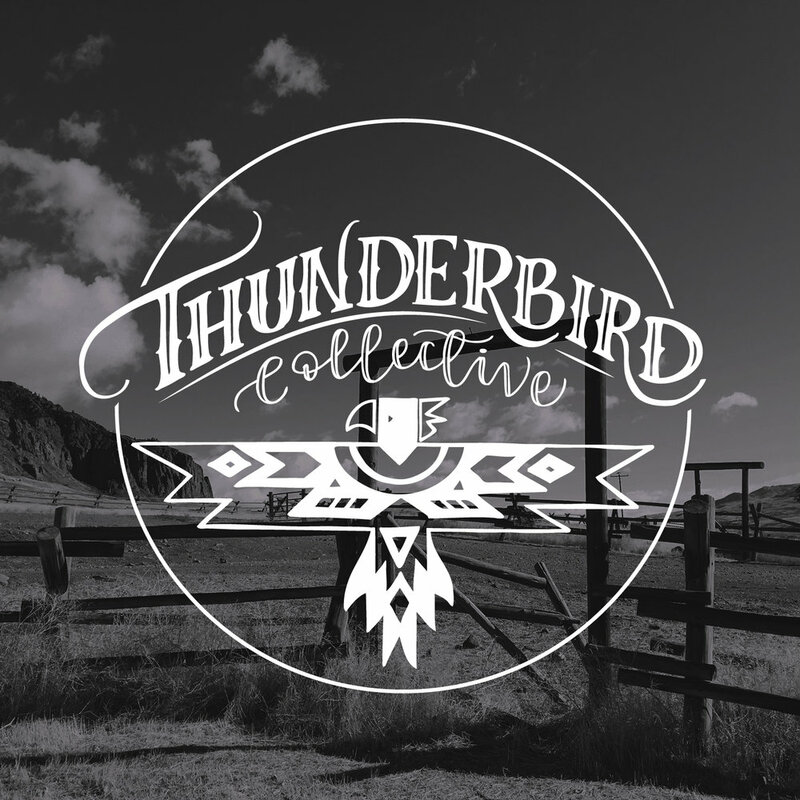 Inspired by Alyson's description, I created this little piece of hand-lettering to help embody the Thunderbird Collective brand. I'm trying my best, but Lord help me - I just can NOT seem to get the hang of Snapchat. Aside from taking the occasional picture as a puppy dog or a dancing bunny rabbit, I have about as much finesse with the medium as I do with a chainsaw. (That is, none at all). I feel especially incapable when comparing my social networking skills to the likes of my teenage compatriots - who not only are capable of using it exclusively & un-selfconsciously as their primary mode of communication, but are well, good at it. Their timing, commentary & ability to take selfies & perform quirky Boomerang-augmented dance moves is masterful. I'm making myself sound old, when perhaps I'm just a slow learner...but either way it is not a tool in my toolbox. Which is a long way of saying - I feel way behind the times. And instead of trying to play catch up - I've decided to embrace what I am good at. I'm going to focus my time & energy on old school, out-dated, practically extinct - SNAIL MAIL. That's right. I'm determined to give letter writing, package sending & envelope addressing the time and attention that I may otherwise devote to failing miserably at modern social media. Not only is it a great excuse to practice & showcase my calligraphy - it's a way for me to share my vintage stamp collection. I have a beautiful collection of vintage stamps from my grandmother. I inherited my knack for collecting from her - and in addition to her many other collections (costume jewelry, Coca Cola memorabilia & anything Frank Sinatra) she had an array of old stamps that I was able to use as a jumping off point for my own collection. When Theo and I started planning our own wedding - he put his time and energy into managing how, when & where the wedding would take place - while I focused on the really important things - like curating a collection of vintage stamps that would compliment our wedding location & our invitations. (Our wedding planning may have been a bit unconventional). Some of the stamps I collected for our wedding invitations - picked for their thematic relevance to our Cody, WY wedding. Note the Buffalo Bill Cody & Wyoming stamps. Since then, I have been asked many many times where I find my stamps - and I have one really good answer. ETSY. God bless Etsy. Today, I sat down to write a description about myself. And god, was it difficult. It opened up a whole can of worms. It opened up all kinds of insecurities, and questions, and dilemmas. How do I describe myself? How in the world do I bottle up this self-proclaimed mutt (I have roughly 27 hobbies, and 1,563 interests) into a few measly sentences? Ugh. It made me realize something. Before I even began, I was already back-peddling. For example: I’m a graphic designer, BUT it’s my side-hustle. I have a full time job that I think of as my true job. I discovered that when describing myself, I immediately down-play the role of art in my life. I’m a calligrapher and a painter, BUT I graduated from college as an English major. For some reason, I feel the need to explain away my art as a secondary part of my life – as a hobby. It led to me to a realization. I struggle. I find advocating for my work & talking about my work with confidence, well, difficult. And outside of my comfort zone. And I hear a lot of people talking about how social media and ‘comparing ourselves to others’ burden us with self-doubt. You’ve heard it – “Comparison is the thief of joy.” But that’s not necessarily true for me. Yes, sometimes those perfect little squares can lead me down a spiral of self-doubt. But, most often, they don’t. There are so many incredibly talented and hard-working people on social media that I draw confidence and inspiration from. I see women embracing their imperfections, and mocking the desire to be perfect. And I appreciate it. But what I’m really talking about are those incredible girl-bosses and go-getters and artists embracing their individual talents & style on a daily basis. Calling themselves artists. Embracing their unique gifts. Showing off what makes them an individual. Having a token style and displaying it proudly. Working their butts off, and showing us what they've created. I recently listened to a podcast in which a calligrapher talked about her struggle with comparing herself to others - how she always felt inadequate. It crippled her desire to continue being a calligrapher. And I get it. Hullo, there are too many talented and inspiring calligraphers, hand-letterers, painters, photographers & leather-tooling goddesses out there for me to count. I am in awe of their talent on a daily basis. It would be so easy to see their skill and immediately think, “I can’t do that. I can not compete with that.” And that speaks directly to who I am. I am a self-doubting, self-conscious, unwilling-to-call-myself-artist, artist. But what I have realized is, I don’t have to do it just like them. I don’t have to compete with them. It took me a while to recognize the truth of that. All I have to do is embrace what makes me, me. I see artists I admire embracing their imperfections. Embracing their messy care-free style, or their bad-habits, or the unique techniques that make their work so approachable. I see them embracing what sets their work apart from everyone else. This confession serves two purposes. One, it advocates for the artists, the creators & the self-taught professionals that, like me, are learning as they go. I am right there with you. I feel you. It is refreshing to admit you don’t have to be perfect, or incredibly experienced, or have accolades or merit to describe yourself as an artist or a professional. You just have to create art. You just have to run your own creative empire, however small. You just have to recognize that your unique perspective is valuable. Secondly, I want to recognize and appreciate all the women & creatives that inspire me. I see you. I so appreciate you. I am so fan-girling all over you. And I hope each time I simply like one of your Instagram posts, or comment with a heart-eyed emoji, you see it for so much more than what it seems – it is me thanking you for your inspiration and applauding your skill. That little red heart notification is a testament from one artist to another – that I would not have the confidence or desire to put myself out there without your shining example and inspiration. Thank you. Your little square boxes mean so much more to me than you will ever know. Please keep doing what you’re doing. I adore it. It motivates me to keep going. So if you’re like me – if you have a hard time putting your artwork out into the world and calling it art, if you have a hard time acknowledging your skills as valuable and need a confidence-boost – here it is. Please keep creating. Please recognize your value. Please keep sharing. So maybe this is a confession, or maybe it’s simply a letter to myself. Either way, repeat after me: I am worthy. I can still make mistakes. I am learning. I am giving myself the space to be imperfect, and unprepared, and unexpected. I’m allowing myself to learn as I go. I will embrace my inabilities, and try for new skills anyway. It’s a process. It's progress. I am becoming a more efficient, more confident artist. There’s that word. But yes, it’s about time I used it proudly. I am an artist. An ARTIST. I created this logo for a fellow horse-woman and friend, Charlene Waddell - who just recently started a business offering support and resources for people interested in red light therapy and aromatherapy. The company's goal is to provide natural therapeutic opportunities and performance support for people, their horses, and pets. Charlene is a distributor for Young Living essential oils and a brand rep for Photonic Health alternative & holistic health services. The process of creating a logo for Char began with a 'mood board' - with the goal of capturing the feel & aesthetic she was looking to encapsulate in her brand. We both agreed her brand should be warm, approachable, and soothing with a little bit of a western accent. From there, I was able to begin drafting ideas. After sending Char some options, we agreed upon the primary logo design that appears in the first image. But, I like to offer secondary branding elements & complimentary logos to clients when I can - I find it helpful to give my client multiple branding options for them to use throughout their marketing strategy. For example, Char didn't want her company to only appeal to horse owners but also have elements that would speak to her human clients and those interested in using her services for their smaller pets. While the primary logo is captivating, I wanted to provide her with logo elements that she could use to for non-horse related marketing items. The complimentary branding elements are more simplistic & less "equine specific" but still embody the therapeutic and approachable feel she was going for, while also staying 'on brand.' The secondary logo designs allow the brand some flexibility and dimension - to support the primary logo or create brand interest. If you're interested in the services The Healing Ride provides, there will be a website up and running soon. In the mean time, you can find more information & get in touch with Charlene through her Facebook page - here. A free printable & a little inspiration for my fellow dreamers & go-getters. Of course, I had super high expectations for our Christmas cards this year. I wanted our first official Christmas card as husband & wife to be extra special. Meaning, I would be way ahead of schedule. Each envelope would be carefully & perfectly addressed with pen & ink calligraphy, EVEN the return addresses. I would cultivate festive vintage holiday stamps, and hand-cut colorful paper envelope liners to add even more holiday flair. Ha. The ghost of Christmas cards past. Note, the festive holiday envelope liners. So, please do not have any delusions of grandeur about my experience of sending out Christmas Cards. Let me tell you - I made it happen, but it was not easy. I was not sipping egg-nog in front of the fire, or penning sweet sentiments while the scent of Christmas cookies wafted from the kitchen. What I was doing was sitting at my make-shift desk, with my unorganized address book while cheesy Lifetime Christmas movies played in the background. It did smell like grandma's freshly made Christmas cookies thanks to my new favorite candle from The Bluebell Mercantile (scent: Gladys' Kitchen) & I did bask in the comfort of our humble little Christmas tree. But despite the stress & rush, what I did find was that writing each individual address out by hand was a great testament to the season - it forced me to pause and reflect on the wonderful family and friends who we have shared countless memories with over the last year. It allowed me to linger on our beautiful wedding photos and reflect on the trip of a lifetime - our wedding week in Cody, Wyoming. So, despite my Christmas card experience not going quite as planned, I am so glad I did it. Not only do I get to share our best wishes and wedding photos with those we love, but it allowed me to take a moment and bless each of these people in our lives as I carefully penned their addresses. It was a great cause for reflection, which in the end, is really what this season is all about, right? Christmas calligraphy & (some) vintage stamps. Now, for my second round of Christmas cards (the ones that I did later because I ran out of envelopes...) I decided to change things up a bit, since I no longer felt the pressure of the Christmas rush and I was working with a smaller quantity of envelopes. I took the time to experiment with different materials. I thought I would share some of my favorite tools so that you can try them too. First, I traded the white ink out for red. My favorite is the Winsor & Newton goache - this time in Primary Red. I also tried a new calligraphy nib - the Hiro 40 Nib - which I loved. Then, just for fun - I did some hand-lettering/faux-calligraphy with a white Posca marker & a Tombow Fudenosuke dual-tip brush pen for some shadowing. Both of these are great tools for practicing your own hand-lettering and brush calligraphy. Thanks you for visiting & observing my adventures in addressing envelopes. I really appreciate it. I hope your holiday season was wonderful, your Christmas was merry & your New Year is happy! Red ink & kraft paper. Playing with my Posca marker & Tombow Fudenosuke dual-tip brush pen. Our humble Christmas tree & my favorite bison ornament. 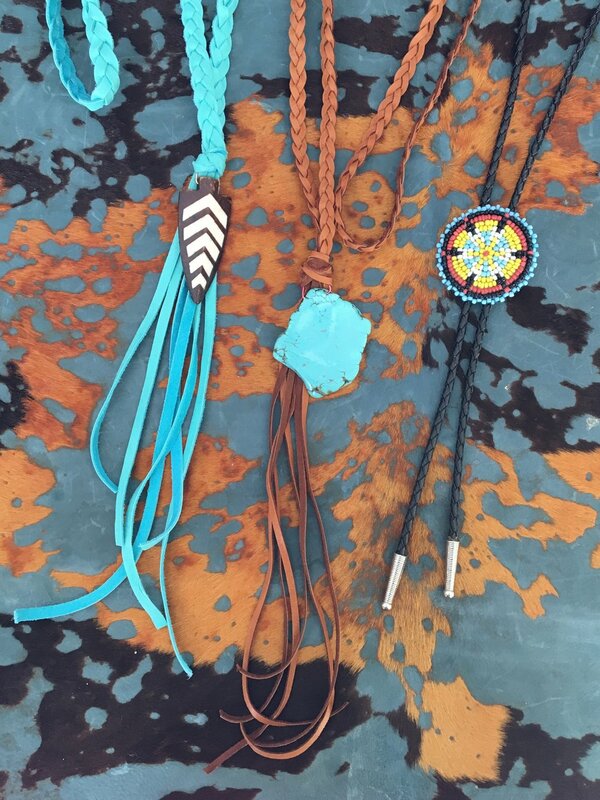 Just a few of my favorite things - turquoise squash-blossoms, fringe & cow-skulls. A few years ago, I felt an overwhelming urge to paint. To actually put paint to brush, and lay down some strokes, if you will. It had been years since I had actually painted something - most likely since a high-school art class, but I felt inspired to create actively and messily with something tangible. The problem was that I did not own a canvas. It was a fortuitous problem, because instead I picked up a plain wallet I had recently purchased and painted on that instead. And thus, my painted wallets came to life. When I began this journey (in graphic design), I was specifically looking for a creative outlet. In high-school, I was always taking art classes and spending time in the art room during lunch and study hall, but as I transitioned to college I left many of my artistic hobbies behind. I would occasionally incorporate a drawing or some hand-lettering into a project, or decorate my dorm hallway with cut-out construction paper, but my opportunities to express myself creatively arose less frequently. After college, I found that I missed doing something artistic. It was a hole in my life - and I found myself yearning for something that would push me creatively. That's when I decided to take a few classes in graphic design and see where it led me. I found relief in being able to work within a visual medium again. Painting wallets has become a stepping stone in that same journey - originally it was a means to express myself creatively, but it has led to much more. It gave me confidence in my ability to experiment with a more tangible medium than just my computer. It has led me to create not just hand-painted wallets but artwork for custom wedding invitations and bridal showers, greeting cards and logo designs. And, I find it incredibly therapeutic. I always feel a little more as ease after sitting down to paint for a few hours. This journey has been an incredibly rewarding one - in all its many manifestations. I feel incredibly lucky to have found a way back into art, and a way to be creative once again. I currently create these pieces on custom order, but my next goal is to open a small Etsy shop or online store to sell these creations. Thanks for taking the time to visit & browse - I really appreciate it. A custom bag I created with lots of western flair. 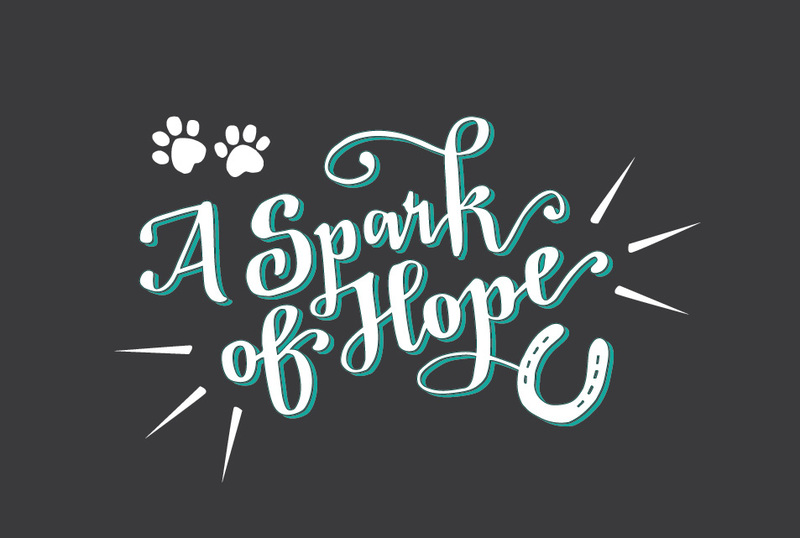 A behind-the-scenes look at a logo I designed for A Spark of Hope; a company dedicated to finding loving homes for dogs, cats and horses. Follow along on Instagram for a glimpse into my daily life. Among photos of what I am currently working on, you will also see heavy doses of sunsets, horses and barn cats.